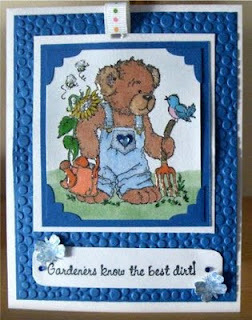 This is a birthday card for a very dear friend & usually I'm always late with his as his special day is very early in January & I forget. This year I'm patting myself on the back for being early. I don't know why the white spots are showing up on the doorway or big rock, they only show in the pic, I did add glossy accents there. This was a combined coloring of gamsol technique, copics & chalks. 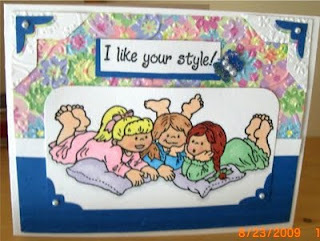 This is a special card I made for a special friend, I know she visits my blog so I can't say for who or why. 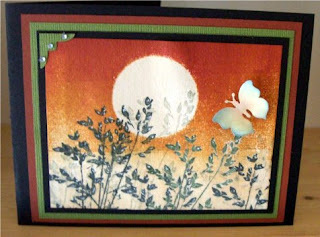 It's been awhile since I've made 5x7 inch cards & at one time that was the only size I made. 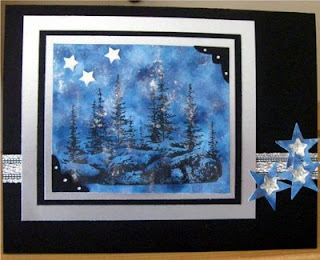 I had a nice break from making Christmas cards by doing these 2 cards. 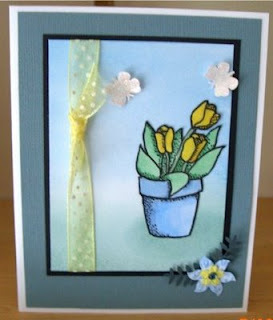 Magnolias are so adorable I really enjoy playing with them. 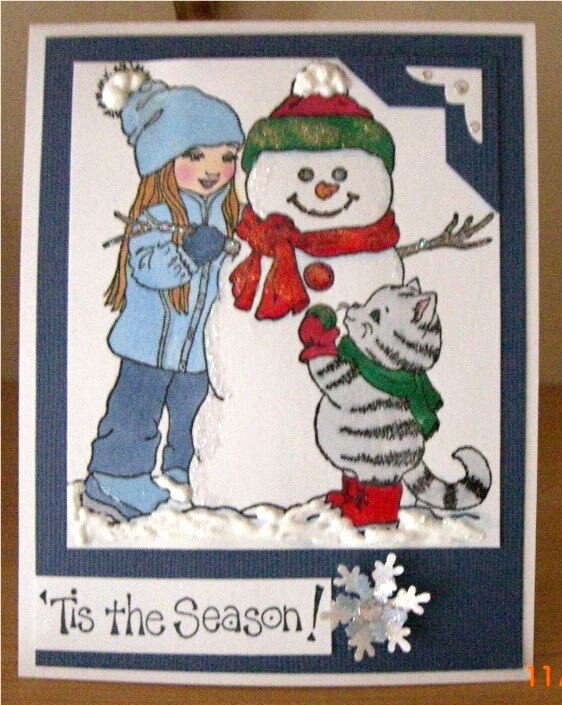 When I saw this stamp form Wags N Whiskers it was calling my name, I just love the little cat at the easel. This little face is just the cutest. 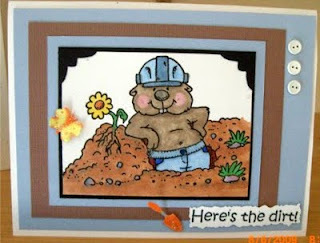 This little critter is from Artful Inkables. 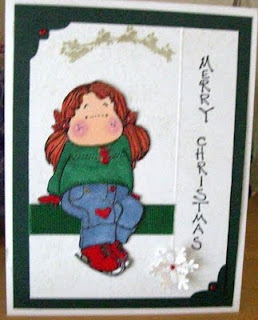 I finally got some Christmas cards done & still have many more to do. 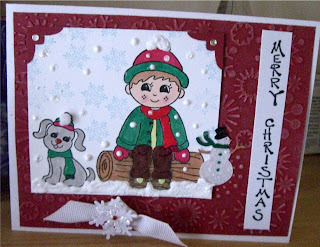 This is actually part of a set of fall stamps I got recently but because I was doing so much beading I didn't get much time to play with them so I decided to color them with reds & greens using them for my Christmas cards. 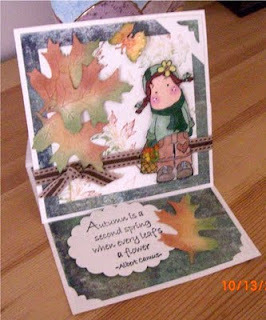 There are leaves under the little boy's feet so I covered them up with "snow". The stamps are from Clear Dollar Stamps. 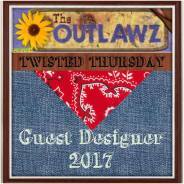 I wasn't too sure about this one, I showed it to a friend & she "begged" it to have her name on it - it's hers. 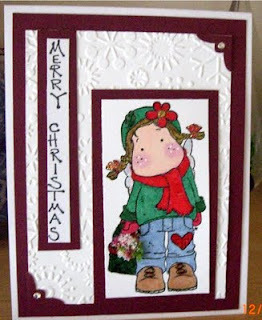 I also got my new & first Magnolia stamps, I think she is called Fall Matilda but a little red, green & sparkle she is now another Christmas card. I finally started my Christmas cards, I love this stamp it's from Wags 'n Whiskers, as soon as I saw it I knew I had to have it. 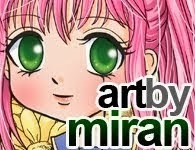 They have some really adorable stamps on their site. 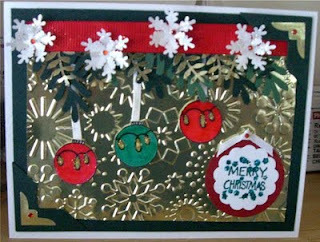 The one thing I love about doing Christmas cards is I can get as carried away with glitter as I want & feel there is too much of it. 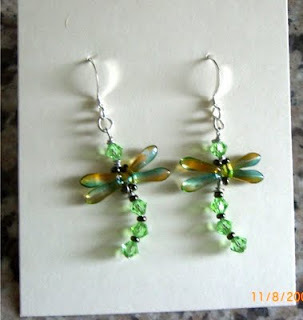 Here are my dragon fly babies I made for the earrings, they are so tine & cute, I just had to give them a try. I missed a bead & that spot is just glaring at me. 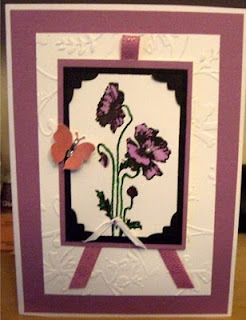 I haven't posted anything in a while but I haven't been making cards lately so thought I'd post my latest thing. I'll be doing a craft fair in a couple of weeks so I've been busy making beaded jewelry. 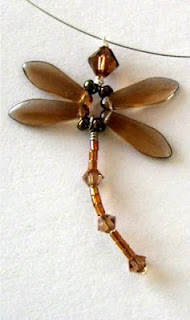 I took a class the other night to learn how to make dragon flies, this is my very first one. Now I want to try making baby ones for earrings. 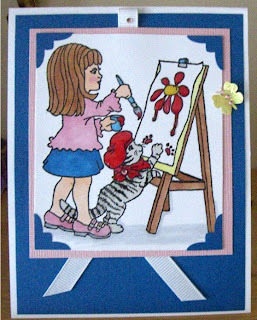 This is how I spent my day, I was having fun making easel cards. 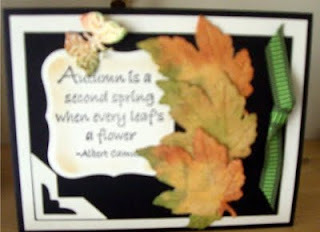 Fall being my favorite season, I just had way too much fun making this one & coloring the leaves in my favorite colors. 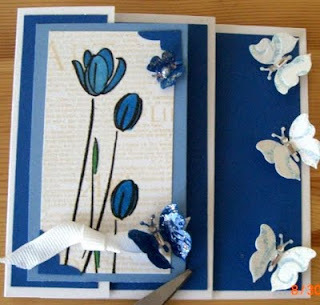 I just found this easel template for cards, I really like this idea & they fold nice & flat for mailing. 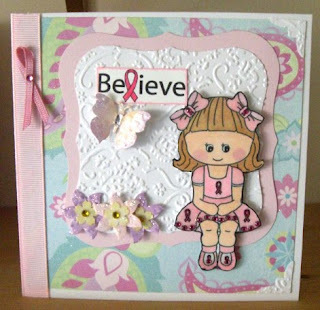 Since October is Breast Cancer Awareness Month & I know so many people who have won the battle & still fighting the battle who have truly inspired me, I just had to make this card, thinking of each & every one of them. This image is from Digital Delights, it was a freebie from their site, you should visit & see for yourself all the darlings over there. 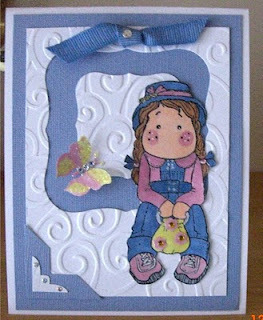 This was a bit of a challenge for me as I'm not a pink person & this being my second card made with a digi stamp but hey practice makes perfect, well, so they say. 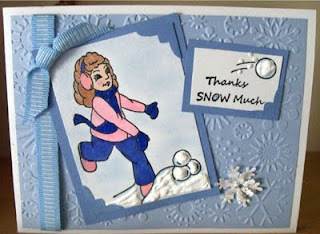 This is a thank you card for a challenge I was lucky to win at Atrful Inkables, their first challenge posted, my first challenge entry & I was number 1 to post, yep I won a grab bag of Artful Inkable stamps, one of my favorite companies. 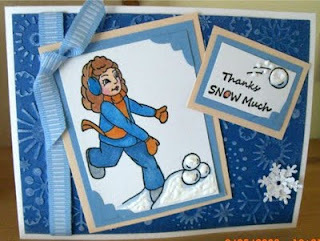 This card should be well on it's way to Utah already & tomorrow it will be. Life held me back a little, hubby had hernia surgery, though he is doing well, he still can't do what he wants so I've be trying to help keep him entertained, not an easy job since we are SO different. I ask myself & him many times how we managed to stay together 30 years, we still like each other too. 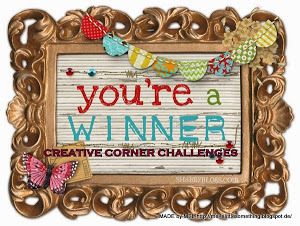 Ok, now I have to go find the envelope, I know where it is behind a drawer but I usually rely on him to pull out these things, it's the kind of drawer that sticks but I have to do it myself, I know poor me......LOL I don't know why this post is all crooked either. 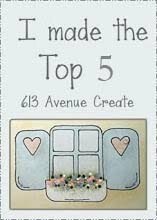 I just love this set from Artful Inkables, have so many ideas on what I want to do I'm sure I'll be making a lot of cards with this set. 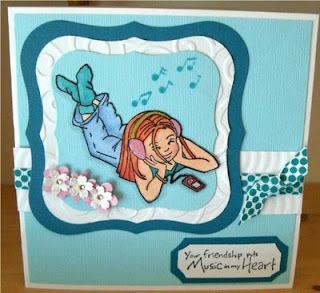 This is another cute set from Artful Inkables, I'm having so much fun with this one. 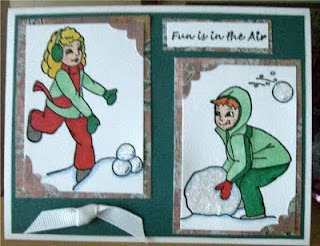 There is another girl rolling a huge snow ball & some really cute sayings. 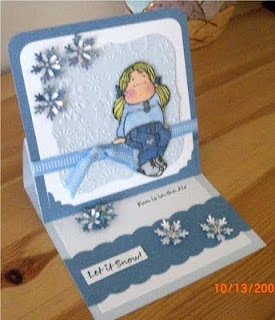 My first winter card of this season, felt strange making it a snowy card. I just got one of those Marvy punches that embosses as well, I love it, so of course I had to play with it. I punched the 6, yes 6 leaves, 3 on cream vellum, 3 on mottled wheat cs, colored direct to paper with my 3 new Momentos, ink pads, I love them too. 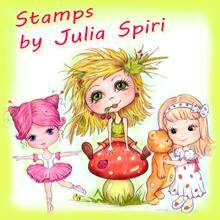 Woohoo, I got to have a stamp shopping day last week, there are no stamps stores in this little town. Colored the cs as well with direct to paper, used sticky dots to adhere them. 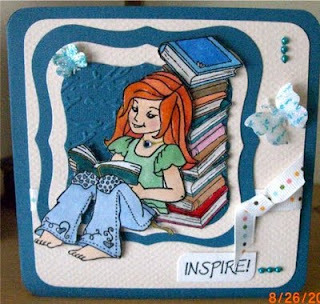 I finally ordered my first digi stamp to see what they were all about, this one is from PollyCraft. I thought this little girl was just so cute, took me awhile to figure the resizing but with help from my friend I finally got it. 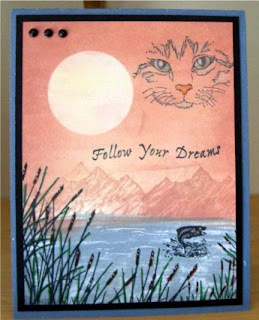 I don't usually make bags or boxes these days, I'm more into making cards but the challenge at Artful Inkables Think Ink Tuesday is a box or bag. 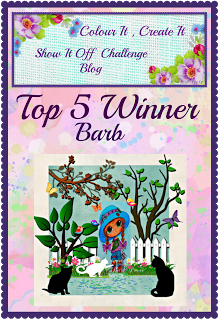 Since I won the first challenge & I hadn't used any of their stamps & they are one of my very favorite stamp companies, I wanted to enter again but this time using my very favorite stamp by AI. 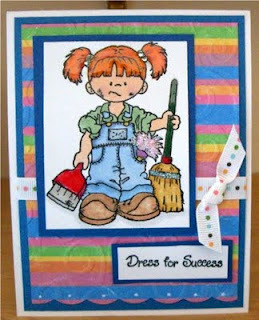 I got the instructions for this little bag at SCS, it was actually quite simple to do. 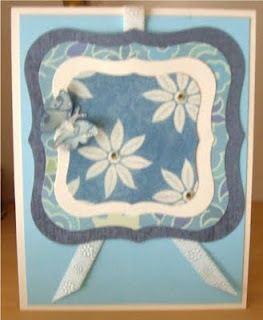 I saw this fold done on Fab Fridays at the Cuttlebug blog, had to give it a try & really enjoyed making these folds. 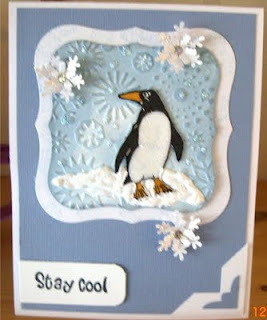 This is a resist technique I did using cream cs for a change, I always seem to use white. 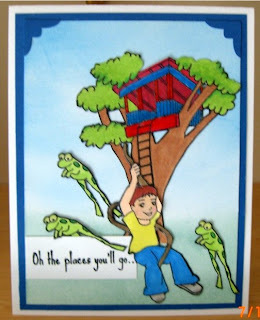 I colored this image over a year ago when I first got my Copics & decided to finally make a card with it. 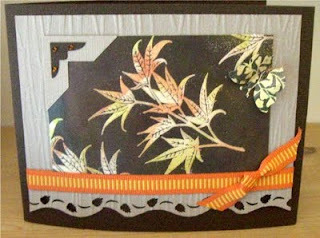 This is my card for the Stamptacular Sunday Challenge, this week they called for 3D & of course some stamping. 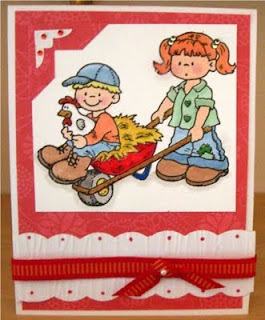 This card is going to a very special friend who is moving to Germany. She loves to read, her books & her 4 cats who are moving with her. At the ripe young age of 66 she is starting a new life, born & raised in CA, she has decided to work for the military as a counsellor, thus the big move to Germany for at least 2 years. I'm so excited for her & of course wishing her the very best on her new endeavor. Oh, there is a cat but it's on the inside, so you can't see it. 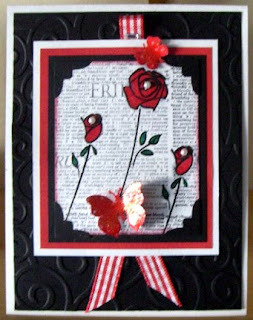 This was my first attempt at faux silk though rather than stamping on the tissue, I stamped the flowers on cs, colored then went over them with my versa pen & embossed with clear ep. 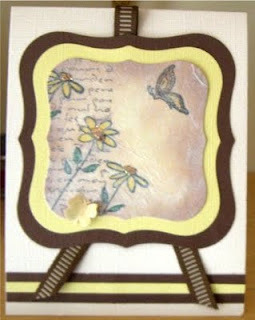 I stamped the script over the flowers & sponged in the background using yellow, peach & brown inks. I finished by crinkling the tissue, applying glue stick to the cs & smothed the tissue over it. 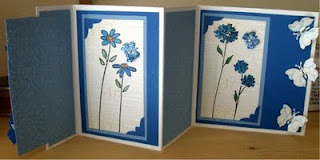 I did add a little glitter to the flower centers on top of the tissue but that's a little hard to see here. 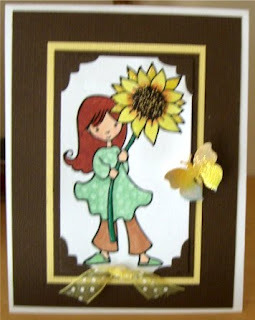 This stamp is from TAC, she is so adorable & I thought she'd be good to use for a sunflower swap. 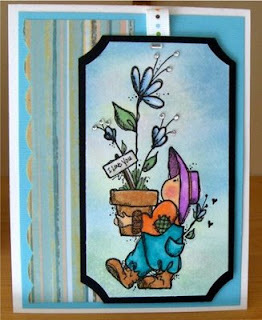 This was just a fun card to do with my freebie from High Hope stamps, it was begging to be inked & colored. 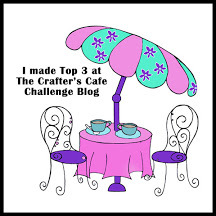 Now this is my second entry to a challenge today & I haven't done any before. 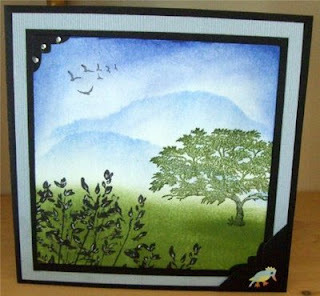 This one is over at Artful Inkables, one of my favorite stamp companies, not only are their stamps adorable but very well cut & very well packaged, you get good service too. 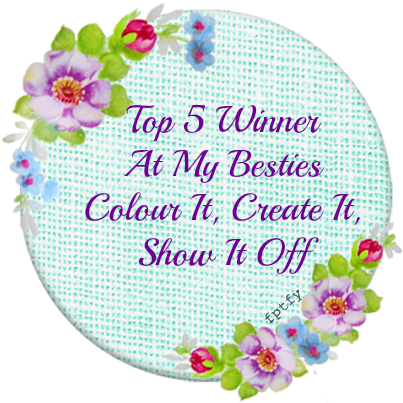 I didn't use any of their stamps even though I do have quite a few, I was just playing around & this is what I came up with so decided to just go for it. 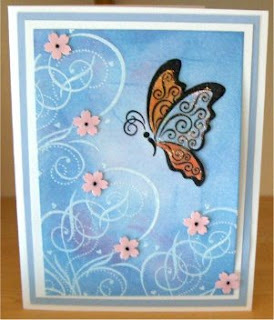 This is a card I did for my first challenge ever to Stamptacular Sunday Challenge. 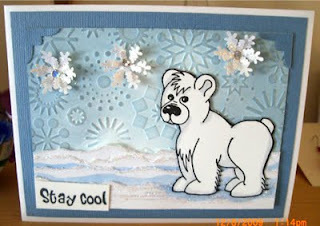 It called for a bear & some stamping, well the bear is stamped, he's an old image from PSX, & the saying is stamped, that one is from High Hopes stamps. Is she not just too cute & oh so fun to color. 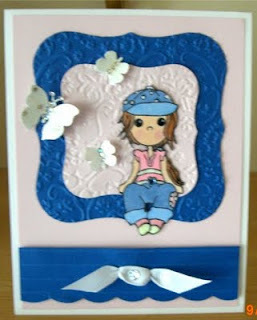 I added flower soft to her wrap & flower on her hat to get a little texture. 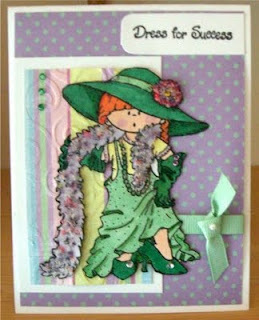 Another cutie from High Hopes. This little guy is from High Hope Stamps, a freebie I received with my order, he was just begging to be inked up & colored with my copics. 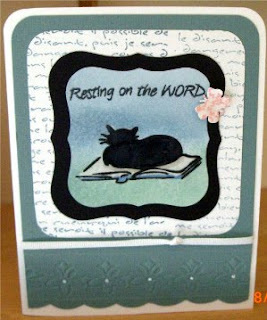 This is part of a set I got at CDS, 4 cats with some cute sayings. 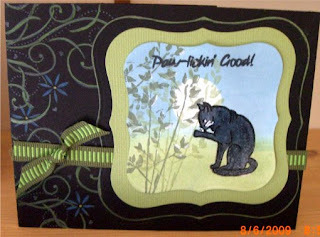 I sponged in the backgrounds, the black card was stamped with white staz-on, then colored with colored pencils. This has got to be one of my favs, I just love the expression on her face. 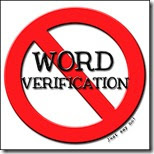 This is another High Hope Stamp. 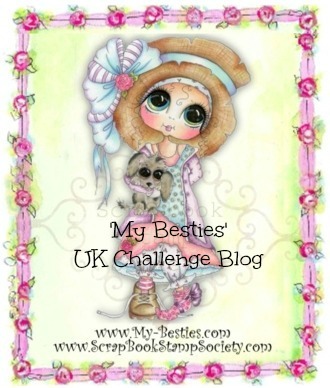 I finally received my long awaited order from High Hope Stamps but it was well worth the wait besides getting some of the most adorable images, Tina added quite a few freebies for the inconvenience. 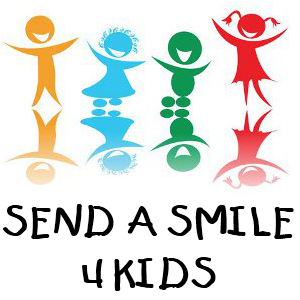 Its sad for me, as of today they will be wholesale only & there are so many of their stamps I still have on my wish list. Guess I'll just have to find who's selling them retail now. I was playing around with Joseph's Coat Technique, it's been a really long time since I tried that one & this is what I came up with. 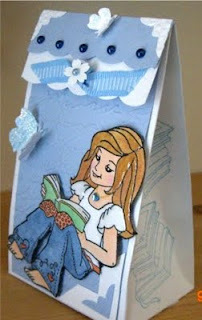 I made this one for a card sketch at an SBS group I belong to, the stamps are from Artful Inkables, colored with Copics. 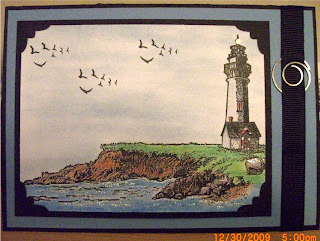 This is a set from Artful Inkables & I am having a fun time with it. 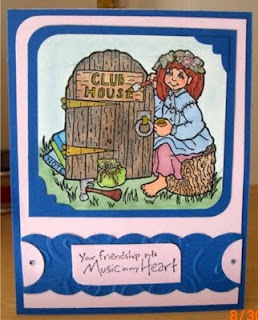 Happy little stamps with some of the sweetest sayings. I'm still playing around with sponges & ink pads, this technique is getting to be just another of my addictions, I can't stop but I sure am having fun. 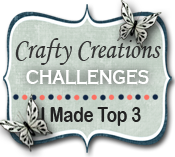 I found this great blog with lots of tutorials that I just love, I've been hooked for over a week now trying some backgrounds with my brayer, sponges & ink pads, I'm having way too much fun. 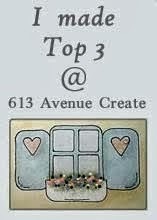 Here is the link if you would like to take a peek, this sure is one very talented lady. 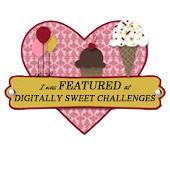 She is also offering blog candy. I've been playing around with my ink pads & sponges experimenting with different effects & colors, finally I came up with one I wanted to post. These stamps are from TAC. 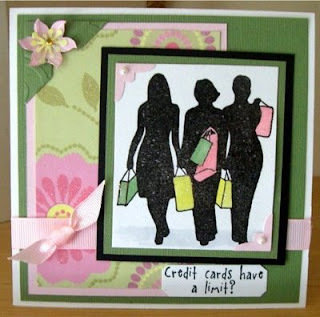 I like this silhouette stamp of girls shopping from Artful Inkables, makes a quick card, the saying is from a different set from TAC. I have so many nice papers but don't seem to use them much but I keep buying them. I was playing around with my alcohol & inks, well I thought I was, couldn't figure why it wasn't working like it usually did. I finally took a good look at the bottle I thought was alcohol, oh no, I was using water.....DUH I like playing with this technique but it sure is messy.